Inspired and award-winning cuisine, lovingly crafted from fantastic local produce, most of it straight from their own farm. A charming country house, with a healthy injection of avant-garde interior design, set in 2,000 acres of blissful silence. Rent bikes or better yet quads from the hotel, the perfect way to explore the Trossachs. Head out with an expert and try your hand at mushroom foraging. Endless trials through and around the Loch Lomond and the Trossachs National Park. The trout-rich Lochs Voil and Doine are at the bottom of the driveway. A golfers paradise with an improbable 52 courses within a 30 mile radius. Waterski, windsurf or kayak on Lochearnhead, a great way to work off your lunch! The hotel lies in the Loch Lomond & the Trossachs National Park, an area with a variety of wildlife and a fragile environment. "They may describe themselves as “first and foremost farmers” but behind the simple façade is a modish, avant-garde interior where urban style – cool Italian bar stools, contemporary art, walls painted in slubby greens and greys, funky headboards and lighting – mixes with antlers, squashy sofas, stoves in the bedrooms and exposed stone walls." 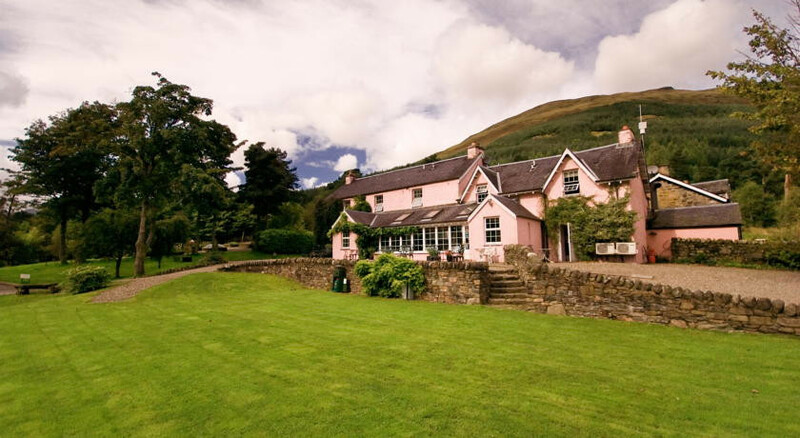 "Above the banks of Loch Voil, not far from Rob Roy’s resting place (in Balquhidder’s village church), you come to an ultra-cool hotel on a hill." "Lewis uses organic vegetables from the farm, local beef, venison and lamb, and fish fresh from the West Coast. The result is some of the best modern Scottish cooking in the Trossachs, an area fast becoming a foodie destination." Lovely views over Loch Voil.